Ghirardelli cocoa powder is specifically formulated to provide you with an incredibly enjoyable hot chocolate experience. Preparation / Recipes: For great tasting hot cocoa... Single Serving: Place 4 level tablespoons of Ghirardelli cocoa powder mix in a mug. Add 8oz. of hot water, stir, & enjoy! 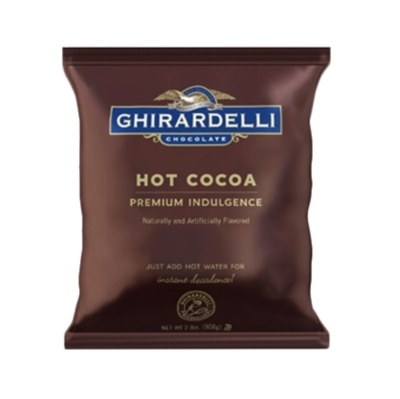 Bulk Preparation: Mix entire contents of 2lb bag of Ghirardelli cocoa powder mix with 1 gallon + 2.5 cups of hot water. Stir & serve! Automatic Dispensers: Empty entire contents of 2lb bag of Ghirardelli cocoa powder into hopper. Do not pack cocoa. Set to dispense 6.2 grams of dry cocoa mix per 1oz of water. Single Serving: Place 4 level tablespoons of cocoa mix in a mug. Add 8oz. of hot water, stir, & enjoy! Bulk Preparation: Mix entire contents of 2lb bag of cocoa mix with 1 gallon + 2.5 cups of hot water. Stir & serve! Automatic Dispensers: Empty entire contents of 2lb bag of cocoa into hopper. Do not pack cocoa. Set to dispense 6.2 grams of dry cocoa mix per 1oz of water.